The Border Hotel at Kirk Yetholm. A man has admitted brandishing a knife as he created a disturbance at Kirk Yetholm’s Border Hotel at the weekend. 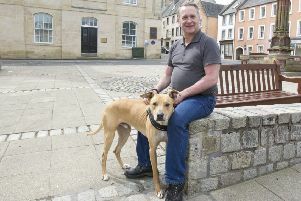 Kenneth McLaren, 49, appeared from custody at Jedburgh Sheriff Court and pleaded guilty to a charge of behaving in a threatening or abusive manner last Friday. He admitted shouting and swearing, threatening others with violence, threatening to damage property, making abusive remarks, sending threatening text messages and brandishing a knife. McLaren, of High Street, Kirk Yetholm, also admitted possessing a bladed article, namely a knife. Procurator fiscal Graham Fraser said there had been a lot of drink involved in the incident. Sentence was deferred until March 4 for background reports.